On WNHH-FM's Dateline New Haven radio program with host Paul Bass talking about the just concluded election and the issues we expect to address in the legislature in the coming year. The flag of Puerto Rico was raised over the State Capitol today on the one year anniversary of Hurricane Maria. On the first anniversary of Hurricane Maria, we remember those who lost their lives and pray for Puerto Rico's recovery. State Rep. Robyn Porter talks to a group from New Haven Adult Education during a recent visit to the Legislative Office Building. State Rep. Robyn Porter visits with a group from New Haven Adult Education at the Legislative Office Building. State Rep. Robyn Porter advocates for the passage of Senate Bill 13 which would prohibit the shackling of pregnant prisoners during labor and during the postpartum period. It would also create a system to give pregnant inmates more support. State Rep. Robyn Porter joins Secretary of the State Denise Merrill and state Reps. Mike Demicco and Michelle Cook at a Girls Scout Pinning Ceremony at the state Capitol. State Rep. Robyn Porter and state Sen. Cathy Osten advocate for strengthening pay equity legislation on International Women's Day. State Rep. Robyn Porter celebrates International Women's Day with state Sens. Mae Flexer, Beth Bye and Cathy Osten, and state Reps. Cristin McCarthy Vahey and Kim Rose. State Rep. Robyn Porter joined lawmakers and advocates to call for the passage of a fair workweek by eliminating the practice of on-call scheduling for Connecticut's big box retail, food service, hospitality and home care workers. State Rep. Robyn Porter joins lawmakers to advocate for legislation that would eliminate on-call scheduling. State Rep. Robyn Porter joins state Reps. Caroline Simmons, Christine Conley and Liz Linehan and state Sen. Mae Flexer to voice support for House Bill 5210. This bill seeks to codify the Affordable Care Act's 10 "Essential Health Benefits" and provisions regarding access to contraception into state law. After celebrating the 45th anniversary of the landmark decision, Roe v. Wade, state Rep. Robyn Porter joined state Reps. Liz Linehan, Cristin McCarthy Vahey and Caroline Simmons, and state Sen. Mae Flexer, to announce their intention to introduce several bills during the 2018 legislative session that defend against the ongoing attempts at the federal level to roll back women’s access to necessary health services. During the second annual Women's March, state Rep. Robyn Porter advocated for gender equality and racial justice. State Rep. Robyn Porter joins state Sen. Beth Bye at the second annual Women's March on Jan. 21, 2018. State Rep. Robyn Porter joined the lieutenant governor and her female colleagues in the legislature at a press conference to encourage more women to make their voices heard at the state level. During a budget debate Oct. 26 in House Chambers, state Rep. Robyn Porter, D-New Haven, raises some concerns she has about the two-year $41.3 billion spending package. State Rep. Robyn Porter, D-New Haven, raises concerns over the latest budget proposal during a debate Oct. 26 in House Chambers. State Rep. Robyn Porter, D-New Haven, receives the Legislative Champions Award from NARAL-Pro-Choice Connecticut. State Rep. Robyn Porter, D-New Haven, joins state Reps. Brandon McGee and Matt Lesser at the governor's signing of House Bill 7146 Aug. 2. State Rep. Robyn Porter, D-New Haven, joins state Rep. Brandon McGee and local advocates at a bill signing Aug. 2. State Rep. Robyn Porter, D-New Haven, watches as Gov. Dannel P. Malloy signs House Bill 7146 "An Act Requiring a Criminal Conviction for Certain Offenses Before Assets Seized in a Lawful Arrest or Lawful Search May Be Forfeited in a Civil Proceeding" into law. State Rep. Robyn Porter, D-New Haven, joins community advocates and state legislators at a press conference announcing the governor's signing of House Bill 7146 "An Act Requiring Criminal Convictions for Certain Offenses Before Assets Seized in a Lawful Arrest or Lawful Search May Be Forfeited in a Civil Proceeding." During a press conference, state Rep. Robyn Porter, D-New Haven, advocates for a measure that would promote pay equity between men and women. State Rep. Robyn Porter, D-New Haven, joins her colleagues to celebrate International Women's Day 2017. State Rep. Robyn Porter, D-New Haven, attends Beardsley Zoo Day at the state Capitol. State Rep. Robyn Porter, D-New Haven, joined several Council 4 AFSCME members for their annual Lobby Day at the state Capitol. State Rep. Robyn Porter, D-New Haven, joined state Reps. Josh Elliott and Mike D'Agostino for a panel discussion held by the Hamden Progressive Action Network. State Rep. Robyn Porter, D-New Haven, interacts with her constituents during a panel discussion held July 10 by the Hamden Progressive Action Network. On July 10, state Rep. Robyn Porter, D-New Haven, joined state Reps. Mike D'Agostino and Josh Elliott for a panel discussion held by Hamden Progressive Action Network. During the panel, Porter discussed the wins and losses of the 2017 legislative session and provided an update on the budget negotiations. State Rep. Robyn Porter, D-New Haven, debates legislation that would increase police accountability. Porter introduced and sponsored House Bill 6663 "An Act Concerning Police Misconduct" during the 2017 legislative session. During the 2017 legislative session, state Rep. Robyn Porter, D-New Haven, debated pay equity in the House Chambers. State Rep. Robyn Porter, D-New Haven, debates the legalization of recreational marijuana in House Chambers. On May 31, 2017, state Rep. Robyn Porter hosted the New Haven Fire Department for a meet and greet at the state Capitol. State Reps. Robyn Porter (D-New Haven) and Liz Linehan (D-Cheshire) and state Sen. Mae Flexer (D-Killingly) celebrate after House Bill 6668 passed out of the House of Representatives May 23 in a 120-30 vote. The bill would amend Connecticut statute to strengthen current protections for pregnant women and ensure reasonable accommodations are provided to employees. State Rep. Robyn Porter (D-New Haven) led House passage of House Bill 6668, which would amend Connecticut statute to strengthen current protections for pregnant women. H.B. 6668 would ensure reasonable accommodations are provided to employees, allowing them to work despite pregnancy limitations. State Rep. Robyn Porter (D-New Haven) joined fellow legislators to advocate for the passage of House Bill 6663, which aims to establish meaningful accountability for police officers who use excessive force. 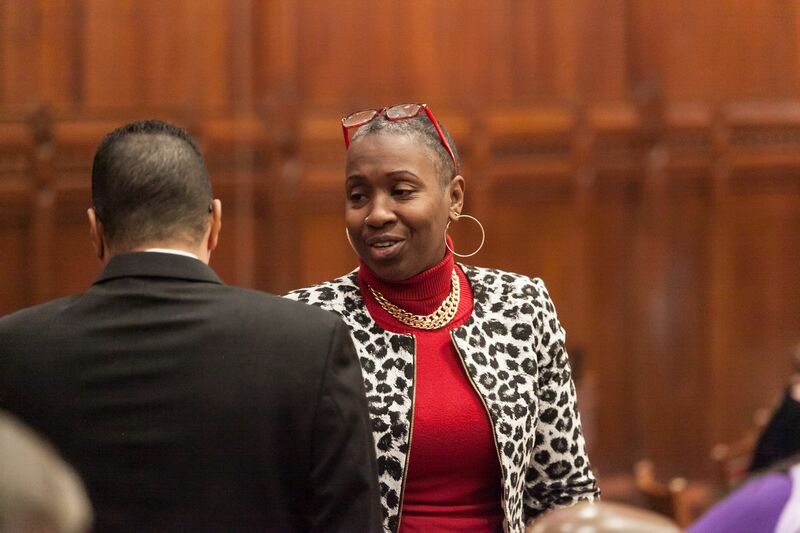 After recent high-profile incidents, state Rep. Robyn Porter (D-New Haven) advocates for House Bill 6663, which would establish meaningful accountability for police officers who use excessive force. Porter introduced and sponsored the bill in 2017, which would require police departments to complete investigations within a 15-day period. State Rep. Robyn Porter (D-New Haven) was just one of many gathered May 9 to advocate for women's rights outside of the state Capitol building. State Rep. Robyn Porter (D-New Haven) joined fellow legislators and rallied for women's rights May 9. On May 9, state Rep. Robyn Porter (D-New Haven) attended a state budget forum held by Action Together Connecticut to discuss funding priorities for the 2017 fiscal year and how the legislature would address Connecticut's ballooning deficit. Rep. Porter speaks in favor of raising the minimum wage and paid family leave, two common sense bills that she is sponsoring this legislative session. The Connecticut Coalition Against Domestic Violence awarded Rep. Porter with the Coalition Crusader Award for her bravery to tell her story of surviving an abusive relationship and the instrumental leadership she provided in passing legislation to help protect victims at the most dangerous time. The Connecticut Coalition Against Domestic Violence presented Rep. Porter with an award for her leadership in passing a bill that orders those who have been issued a temporary restraining order to surrender their firearms or ammunition during the days leading up to their hearing. The Connecticut Early Childhood Alliance named Rep. Robyn Porter as a 2016 Children's Champion. Rep. Robyn Porter golfs at the Seventh Annual Tee Off With Women to End Domestic Violence Golfing Tournament in Glastonbury. Rep. Robyn Porter speaks out about domestic violence at the Seventh Annual Tee Off with Women to End Domestic Violence Event. Rep. Porter listens to testimony during the marijuana legalization hearing held on April 5. State Rep. Robyn Porter shows school children around the State Capitol and talks to them about the legislative session process. Student reporters from the East Rock Community Magnet School questions of their elected representatives. Rep. Porter attended the Bike to Work Breakfast at Devil's Gear Bike Shop in celebration of National Bike to Work Day. She discussed the Vulnerable User's Bill and new bike infrastructure coming to New Haven this summer as well as how she stays healthy by using Farmington Canal Trail.